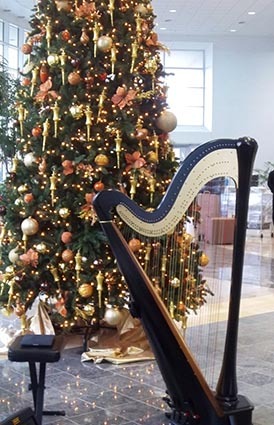 I play Christmas harp music from traditional Christmas carols to modern popular songs, with amplification if necessary. Hanukkah music is available upon request. Whether you are having an intimate dinner party for friends and family or a grand corporate celebration for hundreds, I can delight your guests with their favorite seasonal songs (see my Christmas Repertoire List). A 50% deposit and signed contract secure your date on my calendar. Dates during December book up quickly, so please contact me as soon as your have your date set. Please contact me for additional information or if you are interested in booking harp music for your event!